Audi introduced the first A4 in 1994. Since then, there’s been a number of variants, including a convertible and saloon style. With its superior build quality and class, a used Audi A4 is a compact executive car that comes with a beautiful interior and exterior. The RS4 model has become one of the hottest and highest performing variants of the A4. It's one of the most respected cars on the market, so we regularly display listings for this model. Audi’s build quality is well publicised, and while it may have become a bit of a cliché for dealers to sell, it still stands firm as the brand’s main selling point. Audi always builds superb engines too. The R8 supercar uses the same engine fitted in the RS4, which shows how brilliant the V8 engine is. With a used Audi, you get legendary build quality, up-to-date technology, engine innovations and some serious class. It’s a car you don’t drive aggressively – unless you get the RS4. The car has air-con, airbags, leather interiors, wood fittings and climate control. With a used Audi A4, you get the lot. 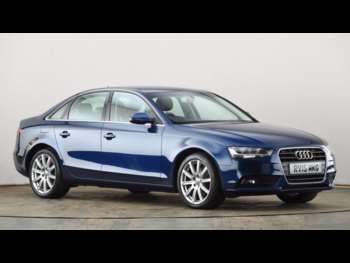 Browse our range of second-hand Audi A4s for sale to discover your perfect match. Older A4s were always said to be front-heavy, due to Audi’s love of putting the engine near to the front of the car. Thankfully, Audi seems to have fixed this issue. Driving a used Audi A4 is an extremely enjoyable experience. The engines are always excellent. Whether it’s a diesel or petrol, you’ll have more than enough power to get around. Got a specific Audi A4 model in mind?